I am always looking for better ways to take care of my skin. 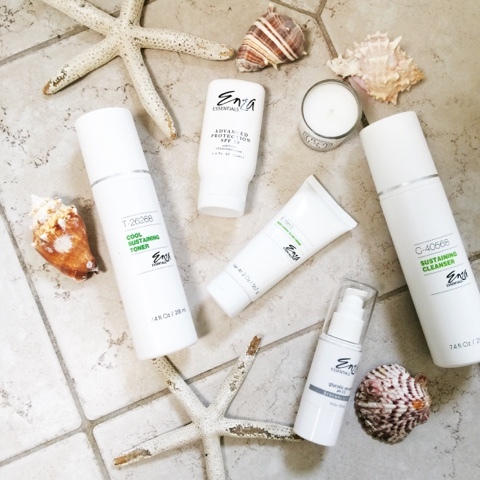 Enza Essentials reached out to me to try their amazing line of skin care products. What I loved most was that they sent me a questionnaire before they sent me any products and they chose products based on my specific skin type. After I had kids, and through the years, my skin has changed so much. It is now a little sensitive and more oily. So this was great to have a skin care routine designed just for me. Enza sent me a folder with a specific skin care regimen for me to follow. There is a morning and evening routine. I have been using these products for about the last three weeks. I can say I am in love. These products are incredible. 1. Sustaining Cleanser-- I did a double cleanse (two times) to get rid of all residue. 2. Cool Sustaining Toner-- I love how smooth and clean this makes my skin feel. 3. Glycolic Serum-- This is so wonderful because it is so lightweight. 4. Advanced Protection SPF 30-- This is such an amazing everyday sunscreen. It is also very light. 1. Sustaining Cleanser-- Another double cleanse. 2. Fine Facial Polish-- I used this 2X per week to remove dead skin. 3. Cool Sustaining Toner-- I swiped this gently with a cotton swab. 4. Glycolic Serum-- Same as in the AM. 5. Sustaining Glow Cream-- This helps moisturize skin overnight. I can't thank Enza Essentials enough for providing me with these amazing products. I absolutely love them. My skin looks so incredible!! I hope you all visit their website to learn more about the perfect Enza Essentials skin care regime for you!!! Happy reading!!! !